Ida Belle Cecil and William B. Gordon, descendants of two early farmers of the Davisville area, lived in this home. farmers in the Davisville area. Samuel’s daughter, Ida Belle Cecil, married William Y. Gordon’s son, William B., and they lived in this house in approximately 1911. Samuel’s daughter, Bertha Cecil married William Y. Gordon’s son, George A. Gordon, and lived in the house behind this one on j Street, 234 J Street. Sharps already owned the rest of the eastern side of the bloc. They apparently converted the house into two units. Another Cecil, Merea, lived in one of the units after she graduated from high school. The structure seems to have been built around 1900, but it is not known who built or originally lived in it. 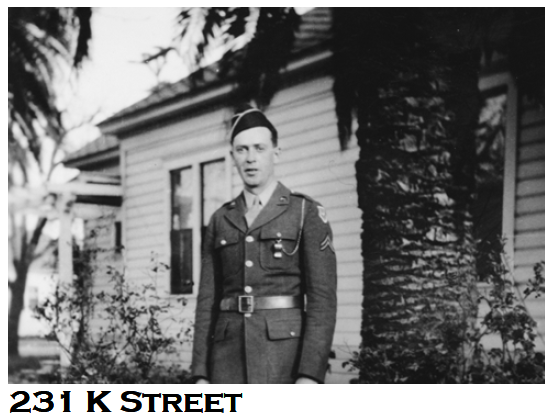 Norman Andrews, pictured above in front of the house, and his parents lived in it from 1939 to 1948, before moving down the street to 1021 3rd Street. This clapboarded, one story has a combination of hipped and gabled roof forms with soffitted eaves. There are trellises, shingled gabled ends and tripartite window compositions. Originally the two units used the same bedroom. Later the interior unit was expanded to include a bathroom. At some point a third apartment was added in the rear.